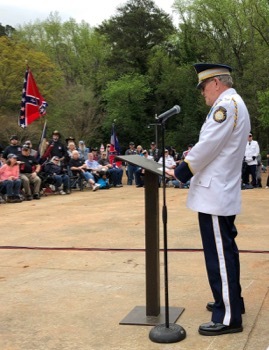 Old Guard Commandant Ross Glover greets attendees at the 18th Annual National Confederate Memorial Service in Stone Mountain Park on Saturday April 6th. LTC David Floyd and MAJ David Denard planned the Memorial Service. Old Guard COL Rick Daniel led Pledges to United States, Georgia and Confederate Flag. Guardsmen COL Richard Straut and MAJ Eric Howell also attended.